I was in high school during the mid 2000s and around that time the 1983 film, Scarface, had a resurgence, or so it seems. All of a sudden it was everybody’s favorite movie. This was around the time I was playing the Grand Theft Auto series religiously and getting into the crime drama film genre. Naturally, I gave Scarface a shot and really enjoyed it. It doesn’t top Goodfellas which, in my opinion, is the greatest crime drama ever made, but it’s a solid film and I’ve always been a fan of Al Pacino. Since then, my interest in crime stories across all mediums has grown and I’ve developed a fascination with the subject. Scarface is more than just a fictional story about a Cuban refugee turned drug lord, it’s also a reflection of the booming cocaine business in the 1980’s and the resulting crime epidemic in Miami, Florida around that time. If you want to obtain real insight on this subject, check out the documentary Cocaine Cowboys. It’s very good. 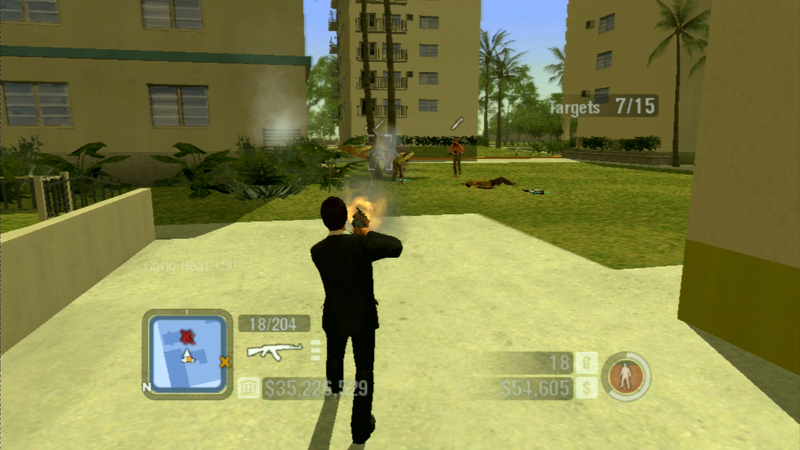 Developed by Radical Entertainment and published by Vivendi Games, Scarface: The World Is Yours was released for the PlayStation 2, Xbox, and PC in October, 2006. 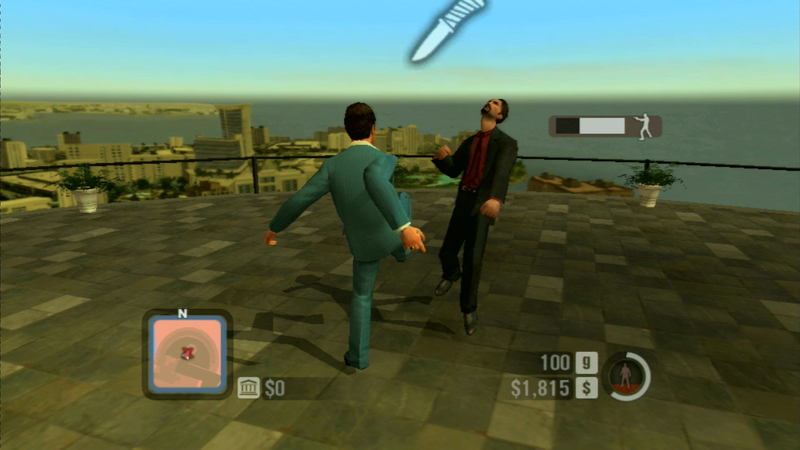 It was ported to the Wii in June, 2007. For this review, I played the Xbox version. This is backwards compatible on Xbox 360 but I believe there’s an issue running it in widescreen so I played it on the original hardware. I attempted to play the PC version, which I do own, but getting it to run on modern systems is quite the hassle and even after I did, I remember not being able to change the controls and I also encountered several bugs. Scarface is actually a remake of the 1932 film of the same name which I’ve never seen. This game is obviously based on the 1983 film and it’s not actually a video game adaption but more of a continuation of the story. Scarface: The World Is Yours takes the “what if” approach which, I know turned some people off for reasons I still don’t understand. The film is about Tony Montana, a Cuban refugee, who arrives in the United States during the mass emigration of Cubans in 1980, also known as the Mariel boatlift. Long story short, Tony is low-level street thug who works his way up the ranks, eventually becoming one of the biggest drug barons in Miami. Spoiler alert He dies at the end of the film and that’s where the “what if” approach of the game comes in. What if Tony didn’t die. I actually knew someone who couldn’t get past this concept so he dismissed the game entirely. You play as Tony Montana and the story starts during the climactic gun battle seen at the end of the film but instead of dying, Tony survives. Unfortunately, this is where the game’s story starts to go downhill. Tony’s goal is to re-build his empire and eliminate Alejandro Sosa, the Bolivian cocaine kingpin who tried to have Tony assassinated and was successful in doing so in the film. You’ll encounter several characters throughout the story but there’s little to no character development and none of the characters introduced here are very interesting. The story is kind of like a revenge tale, I guess, but it takes a backseat to the empire building which is the core aspect of the game and, thankfully, that aspect is enjoyable. Some actors from the film like Robert Loggia and Steven Bauer lend their voices as well as other Hollywood talent including Cheech Marin, James Woods, Anthony Anderson, Michael York, Ricky Gervais, and even Jay Mohr, among others. Apparently, Al Pacino was not able to perform the accent anymore so he could not reprise his role as Tony although the guy who does provide the voice does a decent job. The accent is pretty on point but it’s backed up with awful writing and dialogue. Most of the dialogue seems to only cater to fan service and a lot of it just seems unnecessary. You’ll constantly hear lines from the film, even when the context doesn’t call for it. Tony’s henchman will repeat some of these lines frequently which just sounds weird and Tony swears all the time and at almost everybody he encounters. He just seems to swear and repeat iconic quotes for the hell of it which makes conversations sound odd and unnatural. Overall, the story is pretty forgettable. If you haven’t seen the film, you probably won’t understand many of the references or know who any of the characters are but considering the story here isn’t anything special, it doesn’t really matter and should not affect how you play. But you should see the film because it’s actually good. And you should play this game because it’s actually fun. Tony can walk, run, sprint, swim and take cover behind objects. He can also punch and kick people when in melee distance and the melee combat is very simple. You can carry several weapons and the actual gunplay is a lot of fun. You whip out a gun and put your crosshairs on targets to aim and shoot, nothing new there. But you can actually lock-on to targets and aim for different body parts within the lock-on reticle. This lock-on aiming system also applies when you’re in vehicles. Killing enemies grants you Balls which fills your Rage meter. When the Rage meter is full you have the option to enter Blind Rage mode where you’re temporarily invulnerable, have infinite ammo, can blast through enemies easily, and each kill will reward you two hundred health. There’s actually a taunt button which I call the swear button. If you press it during a gun battle, you can earn extra Balls but if you press it outside of combat, Tony will just swear and it’s quite humorous. The actual arsenal has a decent variety of weapons including a few hand guns, a shotgun two assault rifles, a sniper rifle, a light machine gun, even explosive weapons like the M-79, Bazooka, and a missile launcher. There’s also melee weapons like a lead pipe, machete, and the iconic chainsaw. Bullets can dismember enemies, blood will splatter all over the place, and if you’re close to an enemy, you can perform an execution with your weapon, resulting in a brutal slaying, usually some form of dismemberment. Fallen enemies will drop money, drugs, and weapons. New weapons become available as you progress and you can purchase them from the arms dealer in person. Any purchased weapons and ammunition are stored in your weapons locker which can be accessed from your mansion. If you purchase the Arms Dealer henchman from the exotics menu, you can buy weapons, ammunition, and upgrades directly from Tony’s phone and access your weapons locker from the trunk of any owned vehicles. Eventually you’ll be able to purchase weapon upgrades like extended clips, stocks which increase accuracy, silencers, even double-clips to reduce reload times. Many weapons have one or two upgrades and they’re well worth the purchase. If you take damage and need health, you can acquire health packs which are scattered around or visit sperm banks to refill your health for a small fee. 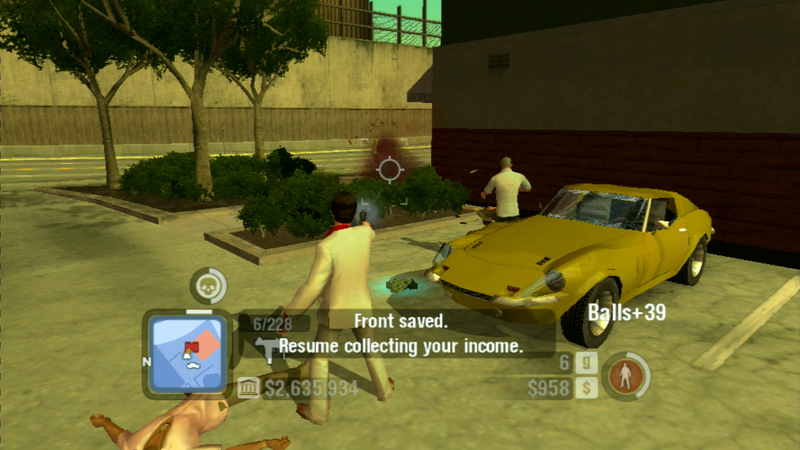 In addition to playing as Tony, if you purchase henchman like the Driver, Enforcer, and Assassin, you can actually play as them and complete jobs for Tony and this is also a great way to make money. Scarface: The World Is Yours is an open world game set in Miami, Florida and eventually you’ll be able to travel to the Islands which are, from what I’ve researched, loosely based on the Bahamas, Caymans, and Puerto Rico islands. Pedestrians walk the streets, boats navigate the waters, and vehicles populate the roads but, surprisingly, there’s no motorcycles. There’s also a serious lack of pedestrians and vehicles on the roads which makes the city kind of feel lifeless at times but I’ll let it go given the age of the game and the hardware available at the time. You can steal any vehicle you want at the risk of alerting police. As you build your empire, you’ll acquire a large roster of vehicles and boats which can be delivered to you by your driver so stealing vehicles is never really necessary. The vehicles have a very arcade-feel to them which I prefer and driving dangerously also grants you Balls so being reckless is always in your best interest. Vehicles can be repaired at car washes and if damaged enough, they will catch fire before inevitably exploding. You can also repair them when calling for a driver and selecting the vehicle. Miami is surrounded by water but there’s plenty of boats to help you navigate the dangerous waters and I say “dangerous” because if you swim for too long, Tony will be eaten by a shark. Many of the features here should be familiar if you’ve played any of the Grand Theft Auto games out at the time but what makes Scarface standout is the empire building. In the beginning of the game, Tony loses everything and his mansion is basically destroyed. He needs to rebuild and he starts the process by making contacts. One of the first people you meet is Felix who will provide you leads to cocaine suppliers. You call Felix, complete a mission, and the next time you call him, you usually have the option to meet a supplier. The story missions are actually pretty good and get a lot better as you progress but the Felix lead missions become repetitive over time. Usually you have to kill people, beat someone up, deliver goods, and even protect people. The story missions have you killing people of course, manning machine guns in helicopters, assassinating VIPs, infiltrating areas, delivering drugs, and other action packed stuff. As you grow your empire and buy exotics you’ll increase your reputation. When your reputation increases, you basically level up and unlock new stuff like the ability to buy new exotics, new weapons, even buy cocaine from larger suppliers. For some reason, you have to visit your mansion to level up which becomes a nuisance. Higher reputation levels also unlock new missions that allow you to progress through the story. Any already completed missions can be replayed from the cheats menu. The only major issue I have with the missions is the checkpoint system. Some missions can be a bit lengthy and do have checkpoints and others do not. The missions do become more challenging as you progress and when you die towards the end of a mission, having to repeat everything all over again becomes frustrating. Scarface includes a minigame where a bar is automatically filled and you need to stop it when it reaches a certain section in order to obtain the best possible outcome. Unfortunately, this minigame is utilized way too much. You need to do it when dealing drugs, laundering money, fast talking cops, and negotiating deals with suppliers and you’ll be doing these things often. Stopping the bar in the fail zone can result in losing money or even being attacked, depending on who you’re talking to. Suppliers sell you cocaine and come in different sizes. The small suppliers will sell you grams of coke which you can then deal to people on the streets or sell to your own fronts. The larger suppliers sell you larger amounts of cocaine which you need to store in your storehouses after unlocking them. You can then distribute the stored coke to all of your fronts and that’s how you make the big money. Once you’ve completed the appropriate missions, you’ll be able to obtain even larger shipments of cocaine from the Islands. When you unlock the Islands stuff, that’s when you can make some serious money. You’ll be smuggling tons of kilos of coke to your storehouses and distributing the coke can give you kind of a rush when you see the hundreds of thousands of dollars you’re raking in from each front. Any dirty money you acquire must be laundered or you risk losing it. Dirty money includes drug money, money earned from completing missions, and money acquired from fallen enemies. To launder money you need to visit a bank and unless you purchase the appropriate investment, the bank will always take a cut of your profits, in other words impose an interest rate. And the rates are actually lower in the banks the Islands. The further you progress through the game, the higher the interest rate. If you die or are arrested with dirty money, you’ll lose the said money so laundering your profits should become a regular thing. Banks are also where you can save your game. The money is used to buy weapons and exotics like different henchman, vehicles, boats, furniture and décor for your mansion, even investments which grant you permanent bonuses. For instance, purchasing Montana Financial removes the interest rates when laundering money, purchasing Montana Fitness grants a health bonus to all of your henchman, and purchasing Montana Defense enables you to carry an extra weapon. There’s several others, some of which are not really that important in terms of gameplay but the reputation system and exotics make you feel like you’re actually growing and trying to buy everything becomes addictive. You can also earn money in other ways like by racing, gambling which also includes betting on bloodsports but the drug business is really where its at. Scarface includes a very condensed version of Miami which contains four main areas – Little Havana, Downtown, South Beach, and North Beach. 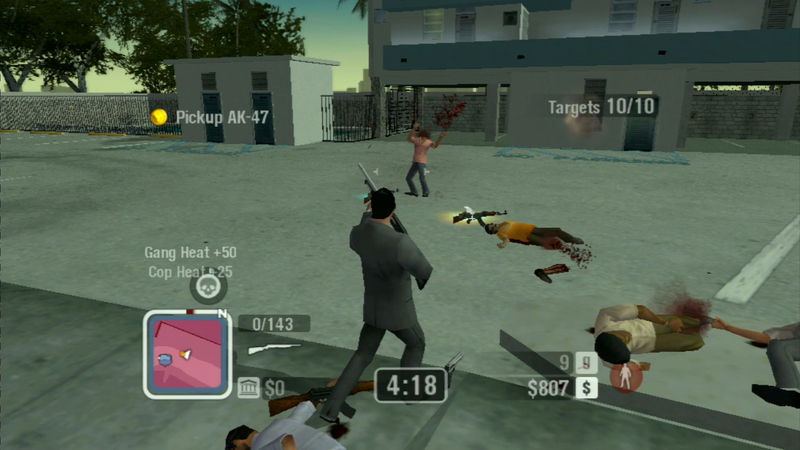 The main areas of Miami can also be seen as turf controlled by different gangs. Unfortunately, the empire building is very linear in that you have to control one area completely before you can expand to the next. You have to deal drugs and earn enough money to buy each front in the area. You usually have to complete a mission for a front before you can buy it. The game follows a pattern; to control an area completely, you buy all the fronts, and then take over the rival gang’s storehouse. Rinse and repeat for each area. You may even have to take over some gang turf before you can proceed to take over the storehouse. After acquiring a storehouse, a new story mission becomes available and after completing that, you unlock the next area to expand your empire. Distributing coke from your storehouses is the best way to earn a lot of money but doing that requires you to follow a four-step process. Step one; complete a Felix Lead mission and unlock a supplier. Step two; purchase large amounts of cocaine from the supplier. Step three; smuggle the coke to your storehouse and do so without getting killed by rival gang members. And if you’re smuggling coke from the Islands by boat, you’ll have to fend off pirates and the Coast Guard as you head towards Miami. Step four; distribute the coke from your storehouse to all of your fronts. As you sell drugs to your fronts, their demand increases yielding larger profits. As you distribute coke your gang heat will increase and rival gangs may attack your fronts in which case you need to defend them in order to collect any money from them. However, you can purchase surveillance and henchman to protect each of your fronts. The extra protection won’t actually prevent any fronts from getting attacked nor will your henchman fend off the enemies themselves. The extra protection just gives you enough time to get there and defend it yourself. After you finish the distribution, you’ll have to repair them in order for them to continue making money. I do kind of wish some of the drug running in general could be automated, at least at the higher reputation levels. Manually smuggling and distributing coke can become tedious after a while and it would feel more like a business if you could have your henchman do it. Still, this entire drug empire concept is very cool and it proves to be a lot of fun for the most part. The fronts themselves are just various businesses around Miami that sell drugs for Tony. Some of the fronts are actually seen in the film like the Sun Ray Motel and the Babylon Club. Besides them making money for you, they also provide small perks like containing an NPC that can restore your health or they may house games and slot machines for gambling. Building a drug empire is dangerous business and you’ll have to deal with rival gangs and police. Not only is each area full of fronts to purchase but the areas are also controlled by different gangs. You can acquire turf by eliminating the gangs. As you explore Miami, you’ll discover gang locations. You visit gang locations and start blasting away gang members to begin taking over the turf. 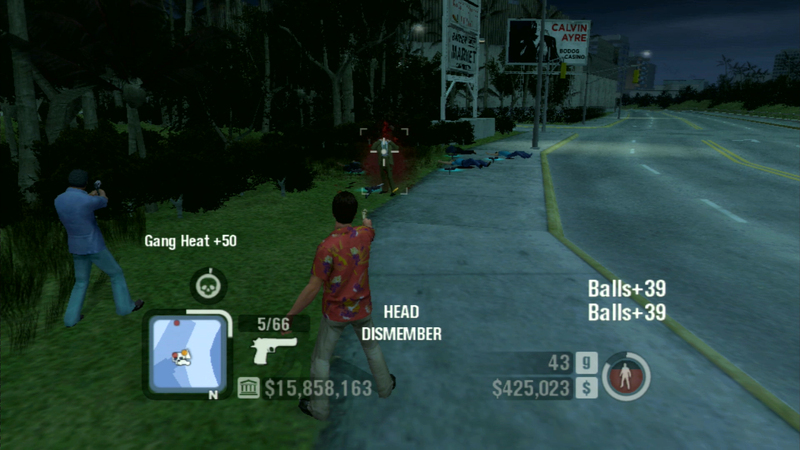 Normally, you wipe out several gang members and sometimes you have to eliminate a gang leader. As you progress through the game, the enemies start to wield deadlier firepower. When engaging enemies, normally Tony is always up against a small army and you can only have one henchman with you at a time unless a the mission dictates otherwise. During the early parts of the game, enemies carry shotguns and submachine guns but eventually you’ll have to contend with enemies carrying assault rifles, rocket launchers, even enemy snipers. 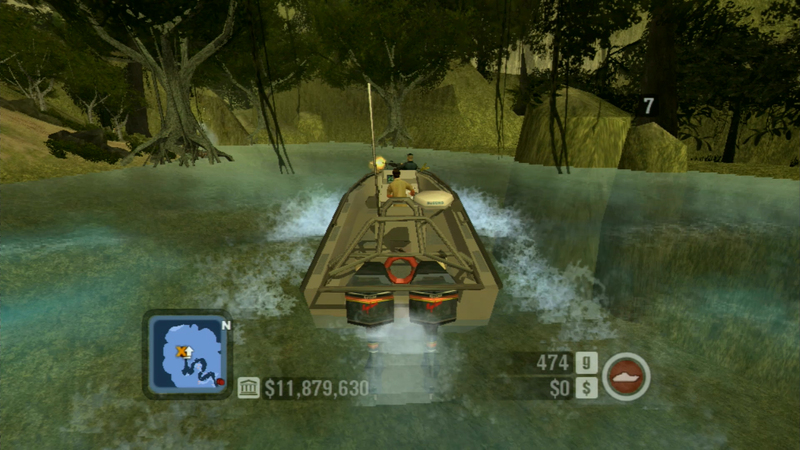 They’ll arrive in vehicles, attack you by boat, and you’ll even be shooting down enemy helicopters. You will, of course, get into a lot of car chases. Enemies will be shooting at you, you’ll be shooting at them, all happening at high speeds and if you slam into enemy vehicles at a high speed, you can stun them meaning they will stop driving for several seconds. Unfortunately, there’s no way to acquire armor in this game but you can accumulate more health by recruiting women to your mansion. Because of the more challenging enemies, it’s always good to call your driver before getting into combat so you have a henchman with you at all times. When taking over gang turf, many times you’ll also have to eliminate any gang members trying to escape. If they do escape, they’ll inform their bosses. Before you can eliminate a gang, the gang area must be active, as in rival gang members must be present. Killing gang members increases your gang heat. When your gang heat is high, it will be harder to distribute coke. It’s also good to know that low gang heat will result in larger profits from dealing drugs in any fashion. The best way to lower gang heat is to pay off Vice from the Empire screen. You can also lower gang heat by eliminating gangs from areas entirely. If you purchase the Enforcer henchman, you can complete missions that involve attacking gangs which also lowers gang heat. As you commit crimes, your visibility to police increases and the rate this increases depends on the crimes you commit. When the visibility meter is full, the cops will start to chase you and you can lose them by leaving the pursuit area. You’ll also accumulate cop heat in the process. The higher the cop heat is, the harder it will be to evade police and the faster they will respond to crimes. Police cars will chase you, they’ll set up road blocks and spike strips, and eventually DEA vans will come after you. If a cop is in the area, it’s best to holster your weapon because there’s a good chance he’ll approach you in which case you can fast talk him and if you’re successful, you will lower your cop heat. If you fail, you’ll lose any dirty money you’ve accumulated and the drugs you’re carrying. Another way to lower cop heat is by hiring an assassin and completing her hit missions. But much like the gang heat, the best way to lower cop heat is by paying off Vice. Paying off Vice can be costly so it’s always a good idea to have a decent amount of money available at any given time. The higher your heat and reputation, the more you’ll have to pay. The police and what I’ll call the “wanted system” in general is a mixed bag. Tony will not kill any innocent people which kind of removes the element of freedom from a game like this. That’s problem number one. Problem number two is that if you don’t evade the police in time, the game will eventually tell you “you’re fucked”, meaning you’re going to die and lose everything you’ve accumulated like drugs and dirty money. Empire building in Scarface isn’t just about drugs and violence. There are some perks. You can hire a driver which will not only deliver your vehicles to you but also double as a henchman who will back you up in combat. You can also command your henchman to stay and defend an area or dismiss them at any time. You can purchase boats, including an attack boat with mounted guns which makes it great for smuggling drugs from the Islands. You can also buy exotic sports cars, construction vehicles, an MPD cruiser, and even an armored car. All of the vehicles you purchase have different stats in speed, acceleration, handling, and armor. I think the two most important are speed and armor. I found that faster cars are better for distribution runs but heavily armored vehicles are a great option for when you’re up against enemies with more serious firepower. If you purchase the limo or the floatplane, they act as fast-travel systems allowing you to travel to any of your fronts or docks around Miami, instantly. As you progress through the game, you’ll be able to recruit various women which just involves talking to them until they agree to visit your mansion. However, successfully recruiting these women will grant you upgrades to your health, stamina, and Balls. Upgrades to your Balls will cause your rage meter to fill up faster. The women just hang around your mansion. As your reputation increases, more exotics become available including furniture and décor for your mansion. You can even renovate your mansion in three different styles. Then there’s the “Pimp Your Mansion” mode where you can place any of your purchased furniture and décor in any spot within your mansion. If you enjoy interior design and decorating, this may be appealing to you and eat up a lot of your time. While there’s plenty of things to buy and unlock, there’s a significant lack of customization. You can customize your mansion and that’s about it. You can purchase an investment which unlocks all of Tony’s clothing and outside of clothing, you can’t customize anything about Tony’s appearance. You can’t purchase clothes or even customize vehicles. I find this somewhat surprising, given the amount of money you’ll be making but it’s obvious the game focuses less on freedom and options and more on empire building. Visually, I think Scarface: The World Is Yours looked pretty good for the time but it has definitely aged. Miami is represented well enough but the game doesn’t really capture the 1980s atmosphere in my opinion. The only two games I’ve played that manage to do this successfully is Grand Theft Auto: Vice City and Hotline Miami. I don’t know what it is but there’s just something missing. Regardless, the textures can appear blurry and the pop-in is rampant but the character models look decent and the Tony model in particular is pretty accurate. The animations are good and there’s a lot of neat little effects, especially during gun battles like sparks that fly, watching bullets rip through objects in the environment, and the debris that kicks up upon bullet impacts on surfaces. I would say this is one of the better looking open world titles for its time. The sound effects are surprisingly excellent. The weapons sound powerful, loud, and the explosions sound booming. You’ll hear glass shatter during gunfights and enemies screaming in agony as you blow off their limbs. As for the music, the actual in-game music heard usually during cut scenes uses the same motifs as what we heard in the film and the game also comes with a soundtrack full of licensed songs. The film’s soundtrack can be heard and songs from other artists are also thrown in there. I appreciate the addition of Judas Priest and Motorhead but most of the soundtrack is not really for me. You can actually listen to the soundtrack at all times thanks to the in-game tape player and even create your own custom mixes. Furthermore, there’s an investment you can purchase which unlocks more songs. As for the performance, it’s all over the place. The frame rate is up and down throughout the entire experience. Mostly down and definitely not consistent. Whenever there’s a lot of action or foliage on-screen the frame rate takes a noticeable dive and in some cases, dips into slow-motion territory. It can get pretty bad. Screen tearing also occurs and quite often. I had a great time with Scarface. The story blows chunks but the empire building is a lot of fun. There’s just something addictive about earning tons of money in this game and having something useful to actually spend it on. The whole drug running/empire building aspect really is the selling point here and it literally makes the game. If the game had no story, the empire stuff would have still made this a decent experience and I do wish developers would take some notes and expand on this empire stuff. There are some areas of it that could use some refinement but, overall, it’s good fun. 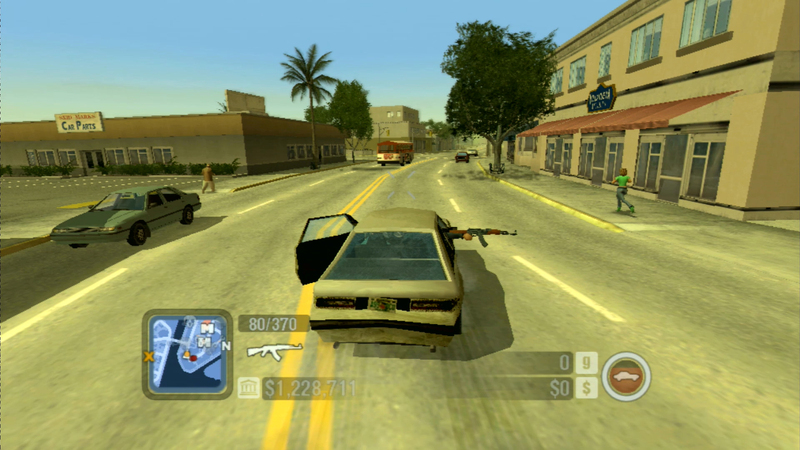 There’s only two games I’ve played that made drug running for money extremely enjoyable – Grand Theft Auto: Chinatown Wars and Scarface: The World Is Yours. The actual gunplay is also a lot of fun and I like how it handles aiming. It’s immensely satisfying blowing off an enemy’s limbs or head and watching the blood gush out and spill onto the ground. I really wish I could get this running properly on PC because I would have preferred to played it on there. I assumed the Xbox version would run better than the PS2 and Wii versions but I haven’t played the others extensively and the performance here can really bring the experience down. Still, the good does outweigh the bad. Scarface: The World Is Yours is an excellent game. It’s a little rough around the edges but it seems like a good foundation for future open world titles. I doubt we’re going to get a Scarface sequel but I would love to see other developers build upon what was established here. I love all this criminal empire stuff and when it’s done right, it’s a lot of fun. I would absolutely recommend Scarface: The World Is Yours to fans of the movie, open world games, and action games. It’s got plenty of action, addictive gameplay, and satisfying combat. Definitely check it out.